Signature Series Supra Drag spec coilovers. Developed in conjunction with 2 Supra specialty shops, MVP Motorsports and Sound Performance, the Signature Series Drag coilovers are tested and proven on the drag strip. The Drag Spec coilovers are assembled and dyno tested in the USA per order. 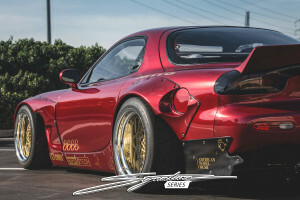 Developed in conjunction with RX-7 suspension specialist shop, AutoRnD for enthusiasts looking for street compliant ride quality with great track performance.